Scalable frameworks, such as TensorFlow, MXNet, Caffe, and PyTorch are optimized for a narrow range of serve-class GPUs. Deploying workloads to other platforms such as mobile phones, IoT, and specialized accelarators(FPGAs, ASICs) requires laborious manual effort. ---> to provide performance portability to deep learning workloads across diverse hardware back-ends. They introduce new hardware abstractions that modern compilers and frameworks are ill-equipped to deal with. Providing support in various DL frameworks for diverse hardware back-ends in the present ad-hoc fashion is unsustainable. Hardware targets significantly diverge in terms of memory organization, compute, etc.. The Goal: easily deploy DL workloads to all kinds of hardware targets, including embedded devives, GPUs, FPGAs, ASCIs (e.g, the TPU). Graph-level optimizations are often too high-level to handle hardware back-end-specific operator transformations. ---> to deliver competitive performance across hardware back-ends. Different hardware devices may have vastly different memory hierarchies. Enabling strategies to fuse operators and optimize data layouts are crucial for optimizing memory access. Modern GPUs and specialized accelerators ahve memory that can be shared across compute cores. Traditional shared-nothing nested parallel model is no longer optimal. Cooperation among threads on shared memory loaded is required for optimized kernels. The latest hardware provides new instructions that go beyond vector operations like the GEMM operator in TPU or the tensor core in NVIDIA's Volta. Consequently, the scheduling procedure must break computation into tensor arithmetic intrinsics instead of scalar or vector code. Traditional architectures with simultaneous multithreading and automatically managed caches implicitly hide latency in modern CPUs/GPUs. Specialized accelerator designs favor learner control and offload most of the scheduling complexity to the compiler stack. Still, scheduling must be peformed carefully to hide memory access latency. An end-to-end optimizing compiler stack to lower and fine-tune DL workloads to diverse hardware back-ends. This separation enables support for novel specialized accelerators and their corresponding new intrinsics. Computational graphs are a common way to represent programs in DL frameworks. They provide a global view on computation tasks, yet avoid specifying how each computation task needs to be implemented. An optimization that can greatly reduce execution time, particulary in GPUs and specialized accelerators. Optimizing data layout starts with specifying the preferred data layout of each operator given the constraints dictating their implementation in hardware. They are only as effective as what the operator library provides. 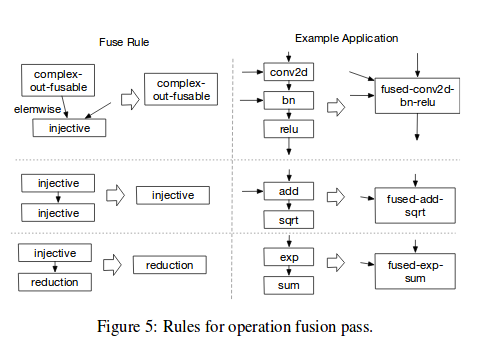 Currently, the few DL frameworks that support operator fusion require the operator library to provide an implementation of the fused patterns. With more network operators introduced on a regular basis, this approach is no longer sustainable when targeting an increasing number of hardware back-ends. TVM provides a code-generation approach that can generate tensor operators. 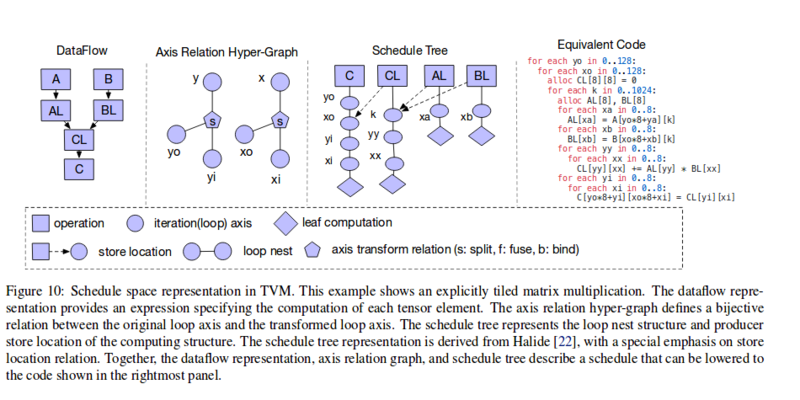 TVM introduces a dataflow tensor expression language to support automatic code generation. Unlike high-level computation graph languages, where the implementation of tensor operations is opaque, each operation is described in an index formula expression language. TVM tensor expression language supports common arithmetic and math operations found in common language like C.
TVM explicitly introduces a commutative reduction operator to easily schedule commutative reductions across multiple threads. TVM further introduces a high-order scan operator that can combine basic compute operators to form recurrent computations over time. Given a tensor expression, it is challenging to create high-performance implementations for each hardware back-end. Each optimized low-level program is the result of different combinations of scheduling strategies, imposing a large burden on the kernel writer. TVM adopts the principle of decoupling compute descriptions from schedule optimizations. Schedules are the specific rules that lower compute descriptions down to back-end-optimized implementations. Parallel programming is key to improving the efficiency of compute intensive kernels in deep learning workloads. Most existing solutions adopt a parallel programming model referred to as nested parallel programs, which is a form of fork-join parallelism. One working thread cannot look at the data of its sibling within the same parallel computation stage. Interactions between sibling threads happen at the join stage, when the subtasks are done and the next stage can consume the data produced by the previous stage. This programming model does not enable threads to cooperate with each other in order to perform collective task within the same parallel stage. This pattern is well known in GPU programming using languages like CUDA, OpenCL and Metal. It has not been implemented into a schedule primitive. TVM introduces the concept of memory scopes to the schedule space, so that a stage can be marked as shared. Without memory scopes, automatic scope inference will mark the relevant stage as thread-local. Memory scopes are useful to GPUs. Memory scopes allow us to tag special memory buffers and create special lowering rules when targeting specialized deep learning accelerators. Tensorization problem is analogous to the vectorization problem for SIMD architectures. The inputs to the tensor compute primitives are multi-dimensional, with fixed or variable lengths, and dictate different data layouts. Cannot resort to a fixed set of primitives, as new DL accelerators are emerging with their own flavors of tensor instructions. TVM uses the tensor expression language to declare the behavior of each new hardware intrinsic, as well as the lowering rule associated to it. 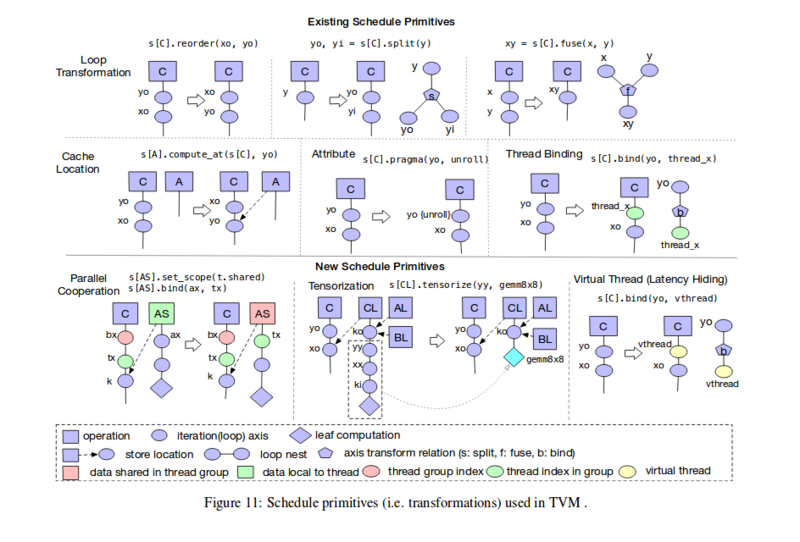 TVM introduces a tensorize schedule primitive to replace a unit of computation with the corresponding tensor intrinsics. The compiler matches the computation pattern with a hardware declaration, and lowers it to the corresping hardware intrinsic. Latency Hiding: refers to the process of overlapping memory operations with computation to maximize memory and compute utilization. It requires different different strategies depending on the hardware back-end that is being targeted. On CPUs, memory latency hiding is achieved implicitly with simultaneous multithreading or hardware prefetching techniques. GPUs rely on rapid context switching of many wraps of threads to maximize the utilization of functional units. TVM provides a virtual threading schedule primitive that lets the programmer specify a high-level data parallel program that TVM automatically lowers to a low-level explicit data dependence program. The code is lowered to an in-memory representation of an imperative C style loop program. TVM reuses a variant of Halide's the loop program data structure in this process. Finally, the loop program is transformed into LLVM or CUDA/Metal/OpenCL source code. 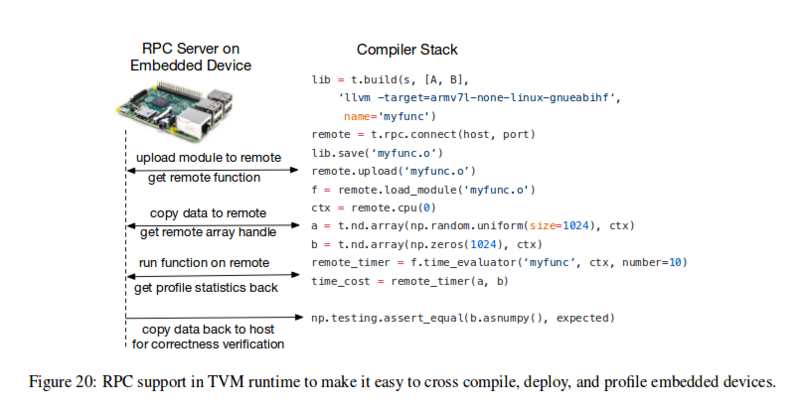 For GPU programs, TVM builds the host and device modules separately and provide a runtime module system that launch kernels using corresponding driver APIs. TVM includes infrastructure to make profiling and autotuning easier on embedded devices. and it accesses the results in the same script on the host. TVM provides an end-to-end stack to solve fundamental optimization challenges across a diverse set of hardware back-ends. 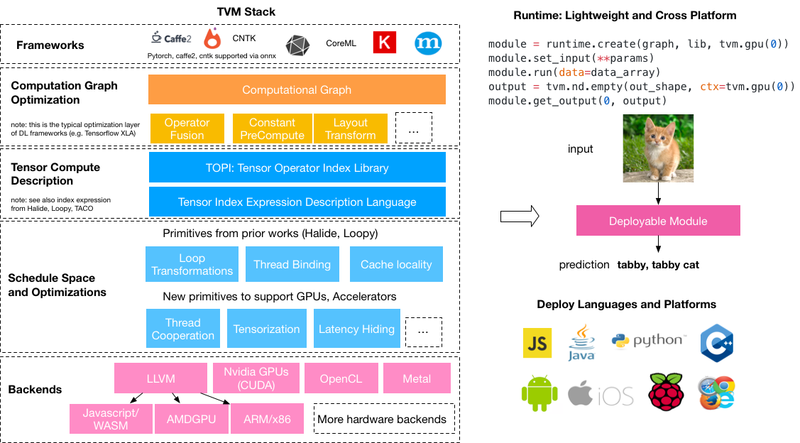 TVM can encourage more studies of programming languages, compilation, and open new opportunities for hardware co-design techniques for deep learning systems.